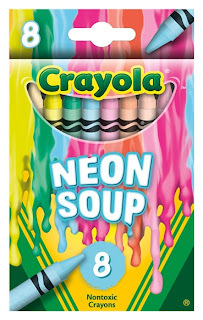 With all the excitement over the Target exclusive "Pick your Pack" Crayola sets, it would seem Walmart wanted in on the Crayola exclusive band wagon again. 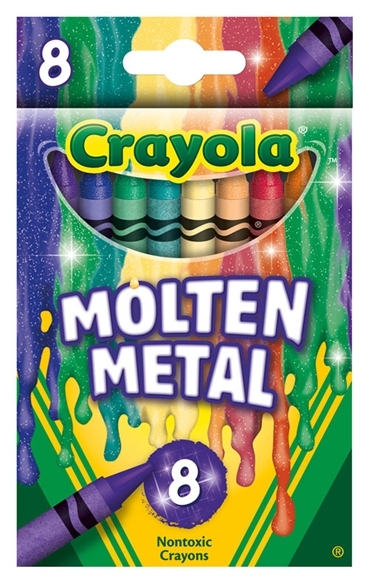 But this time, it was a bit odd because while they contracted with Crayola to develop the new Meltdown set, the set wasn't actually exclusive to Walmart stores. Although that has been the only place collectors have found these. And in terms of finding them? Good luck! So far, they've been very difficult to get. I used my entire network to track a set down. While I found many of the Target set boxes at my local Target stores, none of my local Walmart stores had them. And as seems to be the norm lately, these weren't available online. That makes them quite a rarity given that they are on the market right now. The point of the set is that they were supposed to be especially coordinated for melting effects. The crayons inside the boxes are once again just repackaging of the same colors found in other crayola assortments. 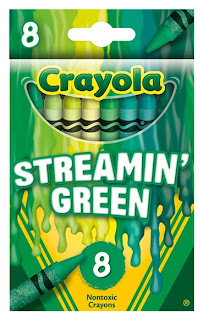 There's nothing special about the wrapper or color names in any of these other than what colors are featured together in each of these 8-color boxes. They also use wrapper type 10 with the tri-lingual color names. Each of the 12 box set has colors selected based on the theme for the box with a little saying on the back. 4. 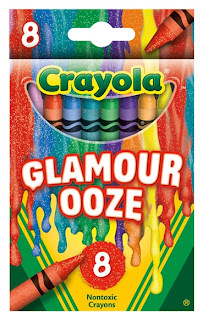 Glamour Ooze: Gloppy Glimmer of Gushing Glam! 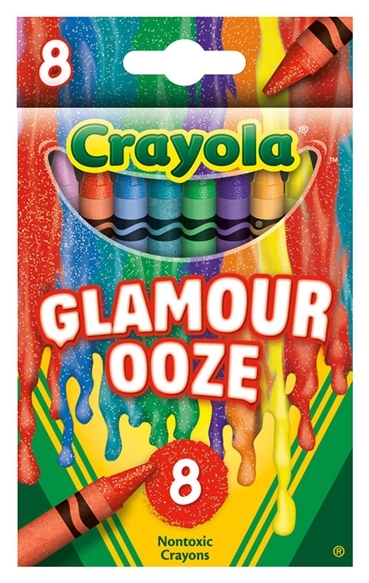 Contains: All glitter crayons which are no longer named colors on the label. From the apparent color (what you see when you look at them) there is one from the green family, orange family, yellow family, red family, two from the purple family and blue family. 5. 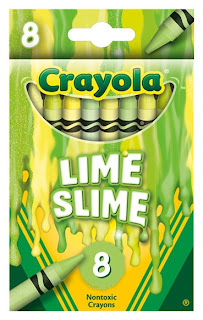 Lime Slime: Slow-Mo Slick of Slippery Slime! 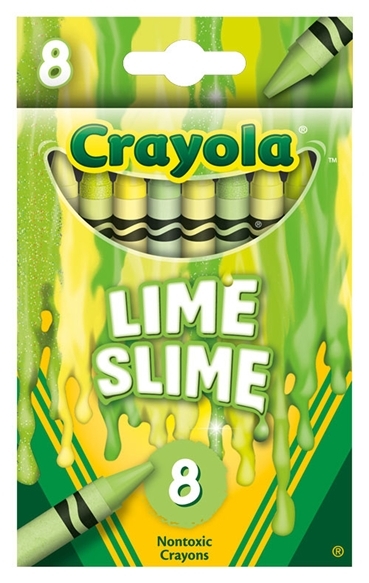 Contains: One unlabelled color from the green family of the Glitter set, electric lime, green yellow, inchworm, screamin' green, sheen green (from the Metallic FX set with their wrapper design), spring green, yellow green. It's interesting to note that plain old Green isn't in this green-themed set. 10. 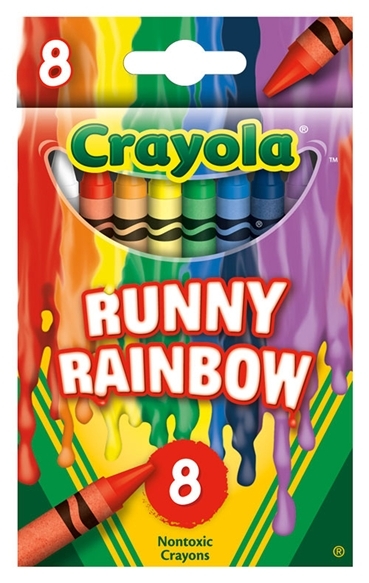 Runny Rainbow: Congealed Collection of Cool Colors! 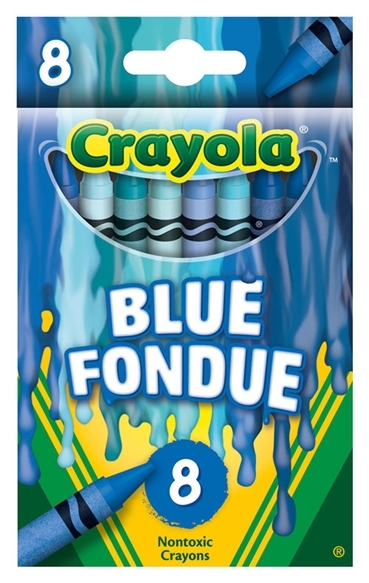 Contains: blue, green, indigo, orange, red, violet (purple), white, yellow. Couple of interesting notes here. White isn't really a color in the rainbow, white is more an absense of color. A couple of the core colors repeat from other themed boxes in this set. 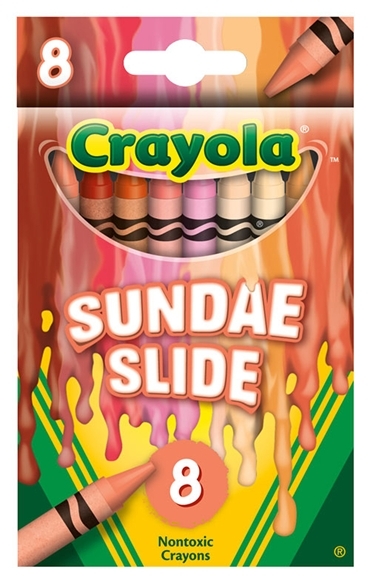 All-in-all, this was a nice theme set for Crayola and crayon container collectors. 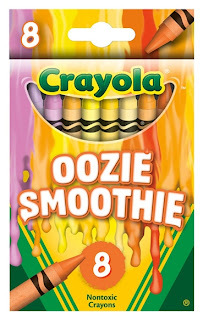 2012/2013 have been pretty dry in terms of new colors coming out from Crayola but the containers have been coming out a furious rate and many are very hard to obtain. Thanks for this info, Ed. It hardly seems fair, though, that we haven't seen new color names in a while. I think "carbon black" was the last one I found. I did manage to get my hands on an older Munsell box with new lettering (all caps) that I didn't have, so I made a small dent on my Need To Find list. Really enjoy the blog. I agree, Donna, it's been slow on the color side of collecting. 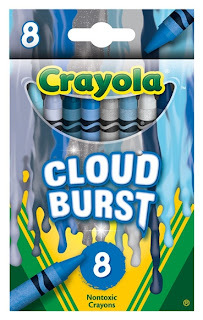 I was sure happy to get that 64 Coloring Box with the scented colors. 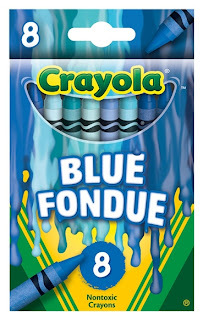 That one had the majority of colors I didn't have. I'm down to less than a dozen colors and most of those are like contests and promotions. A local walmart had these on clearance for $.25 a box! Stocked up for my classroom! 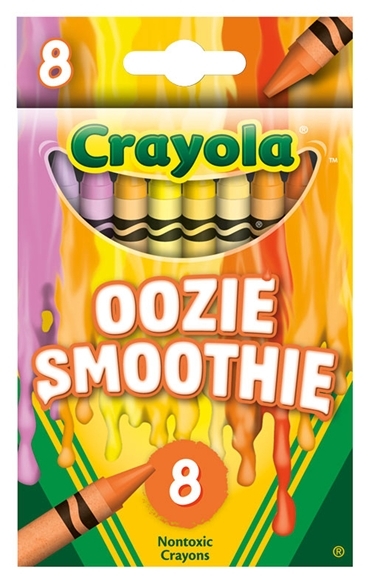 Where can I get these crayons I've been to 3 walmart stores and they have never seen these packs. dzhope - A lot of people are looking for these. You should sell some on eBay! unknown - Wish I could help you but I barely managed to get the set myself and don't know of anyone else with more. eBay is probably the best place to look. I found 1 pack of Sundae Slide at Walmart this weekend. I would like the rest of the set. If anyone has any extra packs, please contact me. 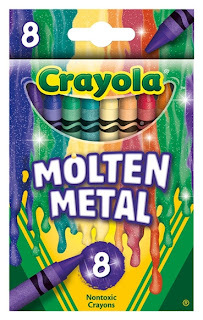 I have some of the Meltdown products if you would be interested still. I have some of the Meltdown products if anyone is interested! 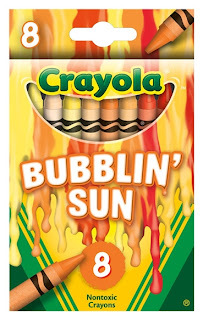 alyssatay3 - Send me an email at webmaster@crayoncollecting.com and I can send any info you want to share about them to other collectors. I'm part of a nationwide collector group that has an email list to communicate. I'm sure there are some out there that would be interested. If anyone has a full set I am interested. Ed, can I have info on your collector group? 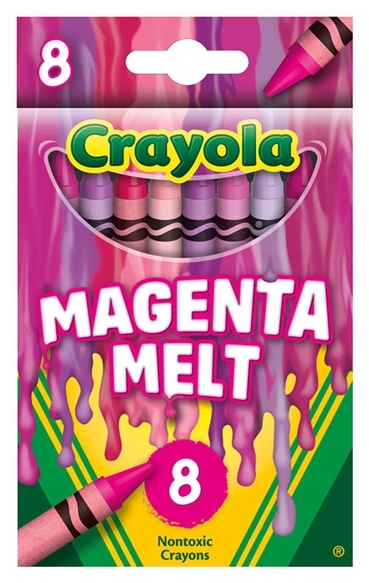 I found the "Meltdown" kit at my local Micheal's craft store. I was surprised because I thought it was a Wal-Mart exclusive set.